Yes please. All of my yes. I've always been fascinated by starship tech in EVE; I need this kind of books/ebooks/posters on my life. This is a Good Thing™. There is one thing that's always bothered me: in many of our ships, particularly the larger ones, there's all these little squares of white light all over the hull. Folks (including me) have called them windows, which implies people walking around behind them (never mind the fact that they'd be weak points in the hull — a lot of weak points). If capsuleer ships have no crew, either these things are not windows, or nobody bothered to get rid of them and the corridors and other crew oriented spaces behind them when the ship was converted for capsuleer use. The latter makes no sense, but if they aren't windows, what are they? While it is true what you say, that pod-retrofitted frigates need less crew (in case of frigates, usually one), the most important aspect of the ship (DRONE BAY) has been completely left out. And this is why I don't care how pretty a picture is, and don't drool over artistic skill, if it makes no sense at all. People are way too easily swayed by pretty visuals. Basically, all ships are retrofitted to house capsules, meaning that there is plenty of maintenance and personnel space which should be otherwise covered. 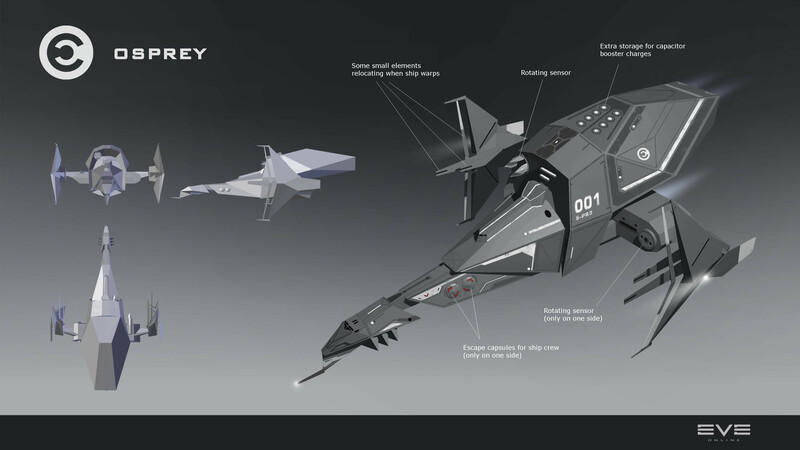 To my knowledge the only ship type that has been "designed for capsuleers" were T3 ships. So in order to make a fitting, proper, plausible cross-section of ANY ship other than T3, you have to first create the regular crew version of it, and then slap the capsuleer parts on top of it, including possibly more gear to fill some of the areas which are meant to be used by crew. Not all of that space. Because else it's becoming a nightmare for maintenance. It's not about realism. It's about plausibility in the given setting. 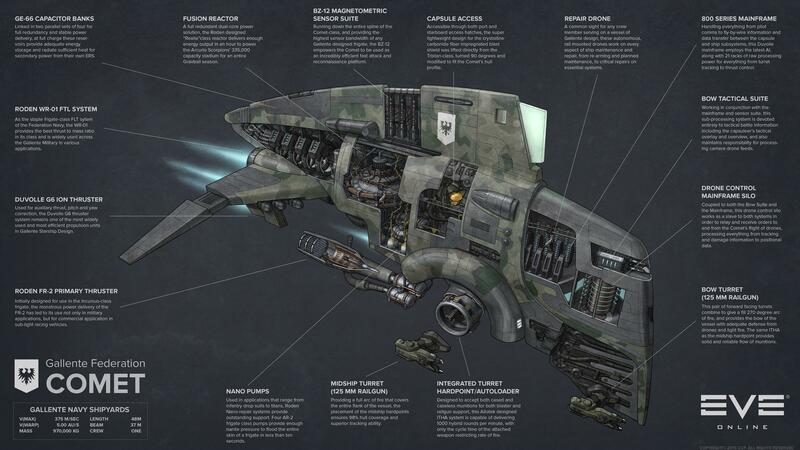 I appreciate the artwork and the artist's skillful hand at delivering cross-sections... but it's not really representative of how the ship with the capsule came to be. Edit: I just got back from shopping, and had the usual issue of not enough space in the backpack. This made me realize something. Where is the cargo space area located in the ship? See, this is another problem I'm having with artistic cross-sections. They only show parts. Either do everything in layers, or don't bother at all. If capsuleer ships have no crew, either these things are not windows, or nobody bothered to get rid of them and the corridors and other crew oriented spaces behind them when the ship was converted for capsuleer use. The latter makes no sense, but if they aren't windows, what are they? Kind of a suspension of disbelief. You know, sometimes the artistic scope on the outside is more important than it's actual use to sell a game of "pretty space ships". Sure, the omnipresent reason of "more light means less accidents" could always be brought but that's about it. As I mentioned in my previous post, almost all ships have not been designed for capsuleers but retrofitted to work that way. That means the exterior is largely untouched. So the latter does make sense, because every extra step of retrofitting is also a cost question. Which is why we are again in the "suspension of disbelief" category. We can be pretty certain that a good number of capsuleers have done extensive cosmetic and functional alterations to their ships, interior and exterior. Only because they're not shown doesn't mean they don't technically exist from a lore and RP perspective. To answer another part of your question, capsuleer ships DO have crews. While CCP tried their damnedest to kill the wiki, with all the lore (and the discrepancy in it), the internet simply does not forget. y... y... Y'all got anymore of dem artwerks?? When I was a kid, I got one of those books with all the Star Wars ships in cutaway views with parts labeled. I wonder if the EVE version of such a thing would sell. I would like a package in book form (bonus points if the books are lore-titled I.E. "roden shipyards general systems guide") and also individual posters of various ship models. Come on CCP, posters of these are way cheaper than actual ship models for my desk. This thread was started over a year ago. Now I know there's a lot of ships in Eve but come on man, it shouldn't take that long to make this book. Agreed. I would dearly love to see this brought to life. Heck, just some posters would be nice. "The truth is usually just an excuse for a lack of imagination." Elim Garak. I favor the idea of our ships having crew. It makes space feel a bit less lonely. Eve isn't about flying the biggest ship, or having the biggest guns. It's about finding something you love to do and doing it better. Gallente born. Guristas driven. The idea behind capsuleers is to significantly reduce the requirement for ship crews and subsequently reduce the number of lives lost in warfare as a result. When you push F1 to fire your guns, you're not relaying an order to a weapons officer to open fire, you are activating them with 'your mind' in the game, as if the ship itself were your body and the guns your limbs. This way, there is no delay between the command to fire, and the actual firing of the guns, making capsuleer-commanded ships so much more superior to crewed ships. You should really read into the lore about it. If I knew where to look I'd point you at it but you might have to Google a bit yourself. I love this kind of crap and have been wanting more of it since forever. Spacepirates dont have to look like crooked teeth in a homeless persons mouth. I would like to see gorgeous space pirates like this (Kei Yuki). 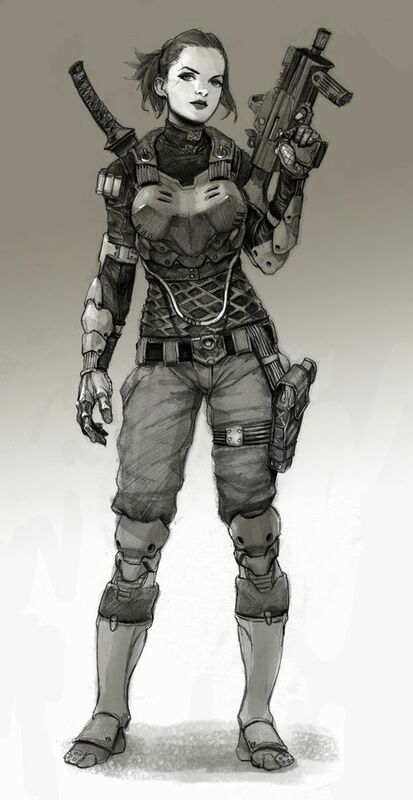 Or this (Lady Armaroid). Or like this. Or like this. Spacepirates dont have to look like crooked teeth in a homeless persons mouth. Why of course. Action figures are dolls, too. Only 28 of the frigates though, I hope the Astero will be included! It must be! If you want an intelligent argument, please do, I'm up for it! But if you want a trolling contest, I will win it by simply not participating. Only the small ships are solely capsuleer-controlled. Larger ships have crews. Look up a Chronicle called "All these lives fit to ruin", if you haven't already.